Inspired by a Neko Case song of the same title. All summer long, the heat and the sun had begun trapping him inside. It started in June when the sun rose at midday to just the right angle and he could feel himself drawing power on it, becoming incandescent with the heat and light, becoming more powerful. He thought the end of days might be coming, that he might actually ignite it accidentally, so he laid in supplies, closed the doors and blinds, and waited out each day in suffocating stillness. He read, mostly; searching the Bible. When that didn’t turn up the answers he was looking for, he went back to Darwin trying to trace this thing back. His only regular company was the cats, but as the summer wore on, they began associating with a feral colony out in the woods and started keeping company with their own kind, bringing them back to the porch in the long evenings to be fed in the dying light. His family finally noticed his absence in September from the annual Labor Day picnic. He had never particularly liked being with people, but they noticed the empty seat on the edge of where the elders now sat and they missed his rude interjections, always interrupting the others’ stories to correct some fact. The family sent his nephew, you know the one, he recently passed his exam and had started work at the nursing home. He stopped by on his way to his shift and after wading across the meadow that used to be the lawn, found his uncle on the back porch surrounded by cats. His uncle explained what had happened, that the sun was now drawing energy from him, but he was winning by staying inside. He explained the genetic mutation he thought he had, told his nephew how glad he was to never have married, to have not passed it down to his generation. The nephew left reluctantly – he was going to be late – thinking he would call old Doc Herman in the morning to see if he could get him out here in the morning. He was relieved to have peace and quiet back as the sound and smell of his nephew’s car faded and the dust settle back on the dirt road. The next day his nephew was back, this time with old Doc Herman. It didn’t go well at all; they listened to him but didn’t hear him, didn’t believe him. They wanted him to go into town and worse – go to the hospital. He’d finally had to go get the shotgun he kept by his bed, chasing them off. He’d be damned if he’d have liars and unbelievers on his property, “Live Free or Die” was the state motto and he took it to heart. They might be back, but he’d be ready for them next time and made sure they understood with a warning shot. It was getting late in the season and here he was, with no wood to get through the winter. It’d become too dangerous for him to go out even at night as his skin tingled in the open air; he had begun drawing on moonlight as well. And he couldn’t ask the family for help, they all thought he was crazy and were ready to put him in a home with old Doc Herman’s help. No matter, though, the house had plenty of rooms he no longer used, all filled with furniture from his childhood, several generations of childhoods, in fact, since he had lived on in the house as the elders had died, the rest of the family left it all to him to manage. He began breaking down night tables and beds, leaving mattresses and bedclothes in the rooms and stacking the furniture wood next to the stove first, then in the wood shed. It was hard work, but not as hard as splitting wood outside. He figured he could probably make it through winter and keep the pipes from freezing if he only lit the fire when the mercury dropped below freezing. He had plenty of winter coats and his blood would keep him warm, even as the equinox passed he could feel the sun drawing on him. They found him in December during a cold snap when daytime highs were only getting into the single digits. The enormous steady stream of smoke coming from where his house was alerted the neighbor, who called the fire department. Could be a chimney fire, the neighbor thought, but it wasn’t – he had managed to set the whole house on fire. They followed his frantic foot prints and occasional blood droplets through the snow, through the underbrush, where they found him in three winter coats holding a dirty knife, stab wounds in his lower back. They never did figure out how he did it exactly, but they got him fixed up physically, at least, and into the state hospital. He spends his days sitting well away from the sunlight streaming through the windows. A few years ago, I started introducing one of my best friends, Suzi, to Miyazaki movies. She had seen Kiki’s Delivery Service, but only that one movie. We started with Howl’s Moving Castle and she fell in love with Calcifer, the fire demon who keeps the castle moving, among other things. As we worked our way through other movies and other cute Miyazaki characters, Calcifer remained Suzi’s favorite. For Christmas this year, I almost got Suzi a plush Calcifer at a store in the mall, but the plush was spendy for what it was and I knew I could do better. 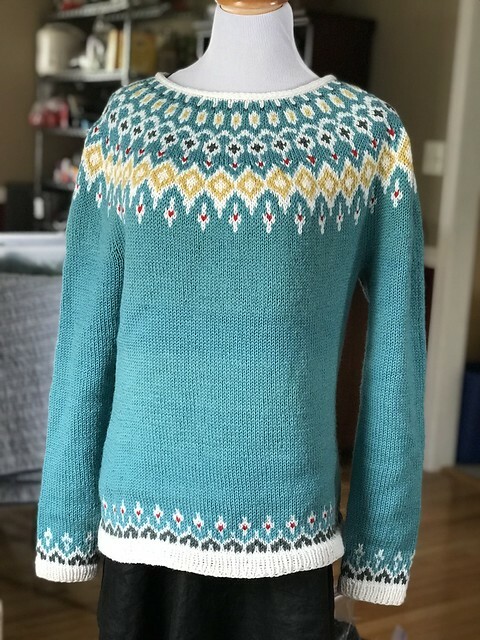 I checked Ravelry for patterns and found this one by Sally Marshall. Now, I’m not so great with intarsia or at least not very confident in my skills, so buying the pattern and attempting this was a bit risky. But the project is small enough that it wouldn’t be frustrating if I failed and I figured I could probably cover up any mistakes with double stitching. I also decided that angora would be perfect for this project. 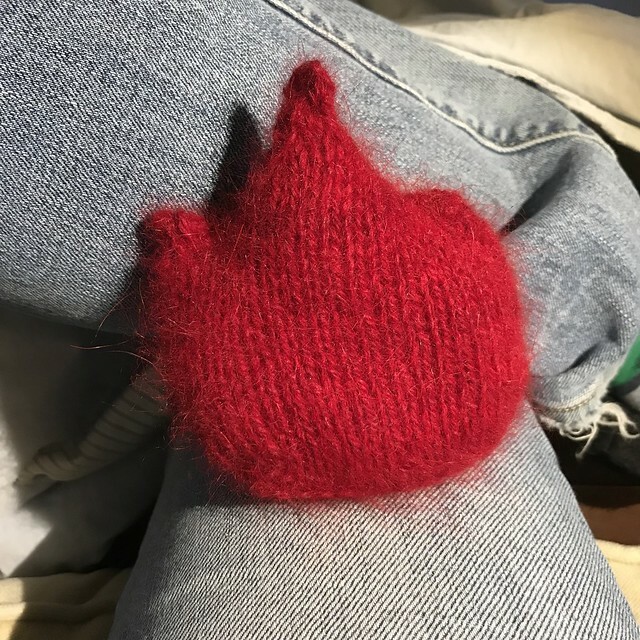 Calcifer would look a bit more fire-like if he was fuzzy and angora would help me with intarsia because it’s pretty sticky. I could have tried mohair, but angora is so much softer, IMO. Plymouth has the only 100% angora yarn in a suitable weight, but the range of colors didn’t include a suitable orange or yellow. The red would probably work though. 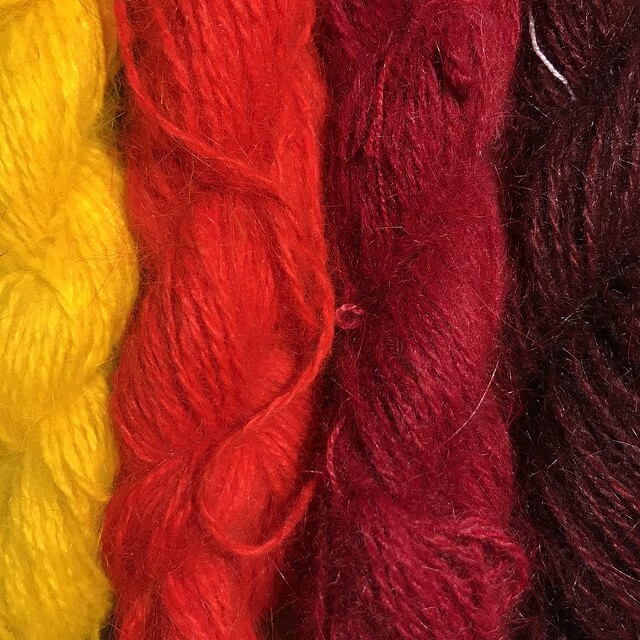 I ordered 1 skein of red and 2 skeins of white angora along with some Jacquard Acid dyes and waited by my mailbox (not really, but that’s what it felt like). When the yarn arrived, I wound both skeins of white into hanks on my niddy noddy for dying and started with orange, Jacquard color 606 Deep Orange. I tried to do the requisite math to reduce the dye recipe from 16 oz down to 10 g, but definitely overestimated. That turned out to be a good thing – the resulting color was almost neon, deeply saturated and almost more red than the commercially dyed red, which now looked pink in comparison. 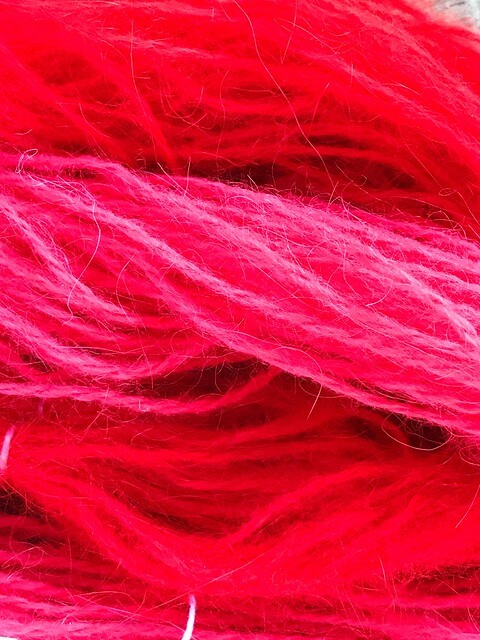 Orange dyed yarn and commercially dyed red. Photo is not filtered or adjusted at all. I used some washed fleece to exhaust the dye bath, which I lated combed and used as stuffing for the plush. This is just one lock; I dyed close to a pound of washed fleece. I’m estimating; I didn’t actually weigh it out, just added more water to the dye pot and stuffed in what I could to sop up the dye. 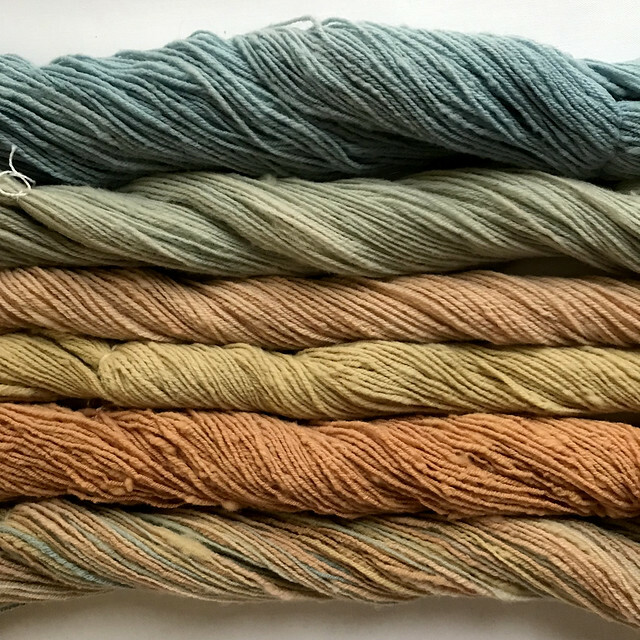 I did that with the other dye baths as well; eventually I’m going to use the wool to make some rolags that look like fire, so keep an eye out here for a post about that. 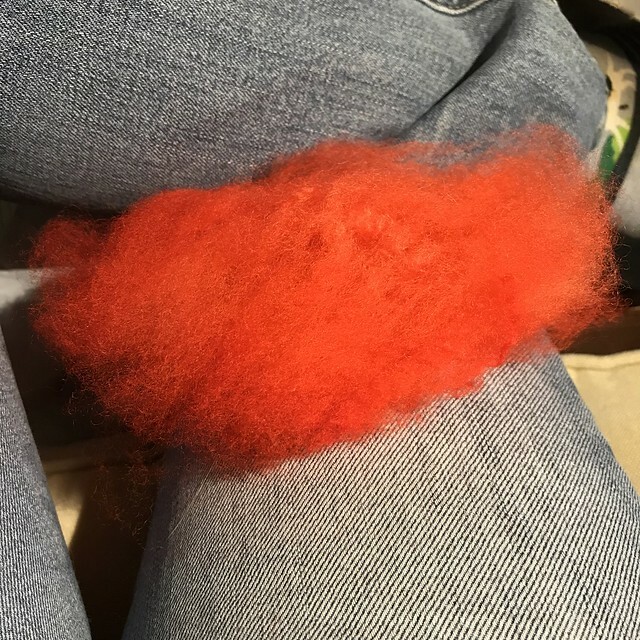 I proceeded to dye yellow yarn (Jaquard 602 Bright Yellow) and then thought I’d try overdyeing the commercial red with a red I had on hand – Jacquard 611 Vermillion. Vermillion ended up being much to dark and a bit too maroon to work for Calcifer. I ordered more yarn and more dye, Jaquard 618 Fired Red. A week or so later, I had dye success. Below is the full color range of angora I dyed. By this time, I knew I wouldn’t have Calcifer done in time for Christmas, which is not a big deal; last year Suzi and I exchanged gifts in January. The pattern is knit in flat pieces starting with a garter stitch base. Instead of knitting the front and back separately and seaming them to the base, I picked up stitches along the base and knit them attached that way. 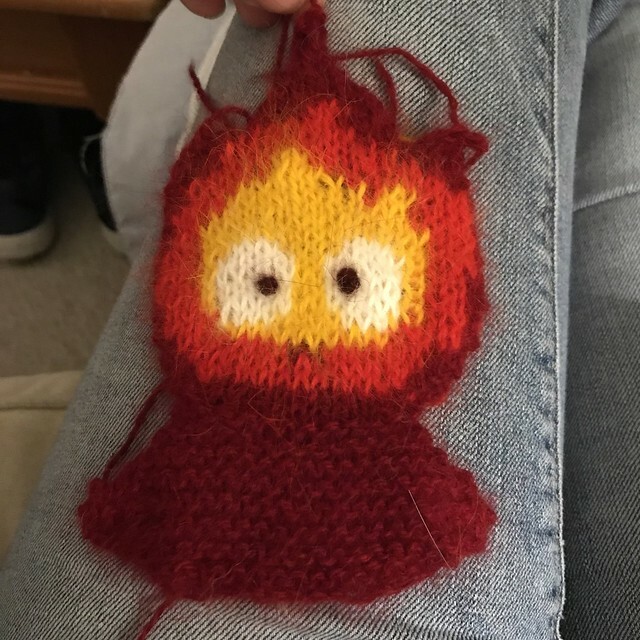 I didn’t think I would use the Vermillion-dyed yarn at all, but it ended up being perfect for the French knots that are Calcifer’s pupils. The intarsia was challenging and it’s not 100% perfect – some of the stitches are uneven, some are pulled too tight – but I used a needle to even some stitches out manually and double stitched others while weaving in the ends to cover up the glaring holes. 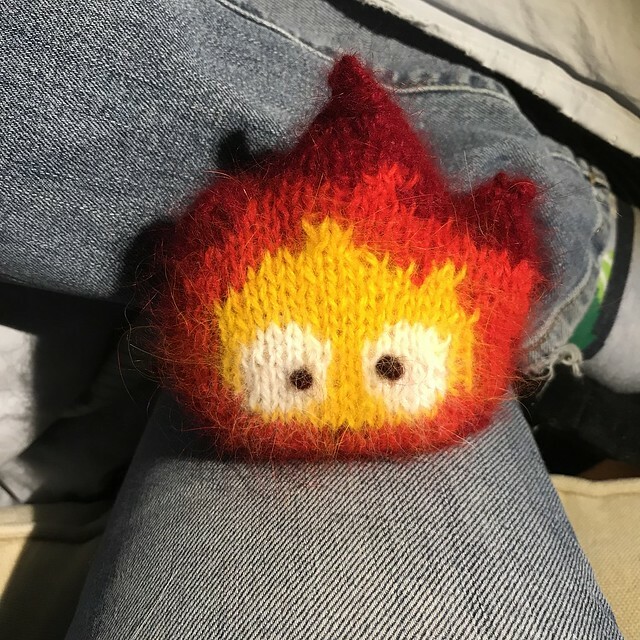 Finished Calcifer front – isn’t he cute? I thought making the back look like the front but without the eyeballs, but I was anxious to finish him and I didn’t want more intarsia & noodling out the pattern to slow me down. Maybe I’ll make another where the back echoes the front colors. Suzi and I met for milkshakes (our thing) last Friday and I gave her Calcifer, along with a Clapotis I made for her (it will always match her hair, which she colors frequently), so I feel like I can finally post about it without potentially spoiling the surprise. She’s thrilled! She says that he is “The softest fire I’ve ever touched!” Mission accomplished! Ravelry project details, in case you’re curious. What the heck is this? It’s for week 2 of a writing challenge, 200 words each day about dreams. Jenny had insomnia. 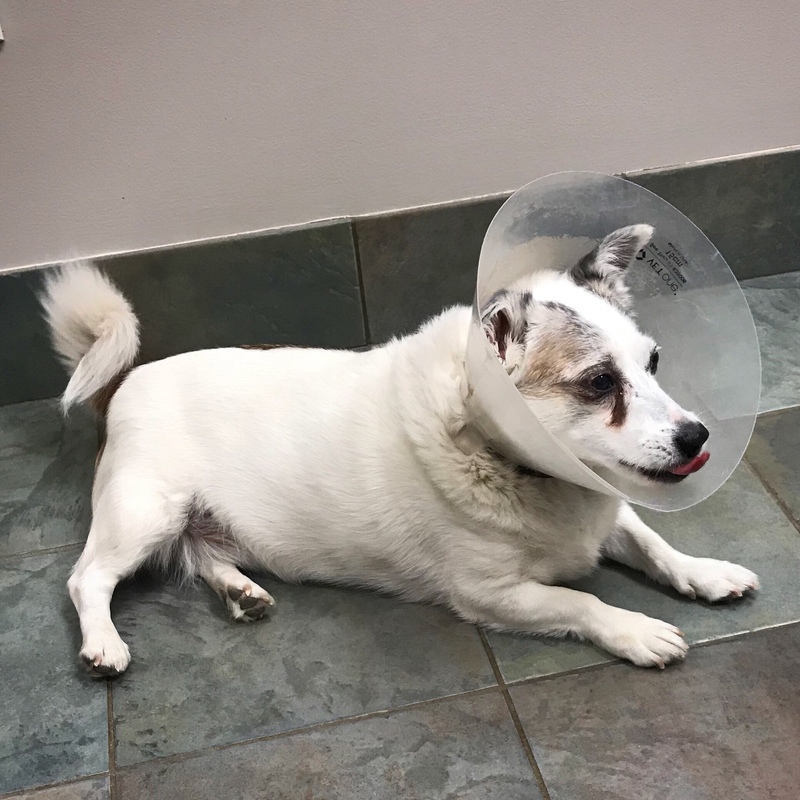 It was infuriating – she was so tired she couldn’t keep her eyes open, but as soon as her head hit the pillow, her thoughts kicked into overdrive and she was wide awake. She tried everything to go to sleep at a reasonable hour, instead of uncomfortably and hour or two before her alarm was set to go off. She tried good screen hygiene, not watching TV or using her phone or her iPad for hours before her bedtime. It didn’t help. She tried yoga, herbal teas, light evening meals instead of heavy dinners. She tried cutting caffeine out of her life entirely, with disastrous results; she fell asleep at her desk, which is not a great way to keep a job. She tried cutting sugar out of her diet, and while it did help her loose some of the jiggle in her middle, it didn’t help her sleep. She tried hypnotism with a somewhat shady therapist on Fifth Avenue for a while, too, and it did help for a little while, but gradually the time she was awake when she should have been sleeping started increasing again. She missed dreams the most. 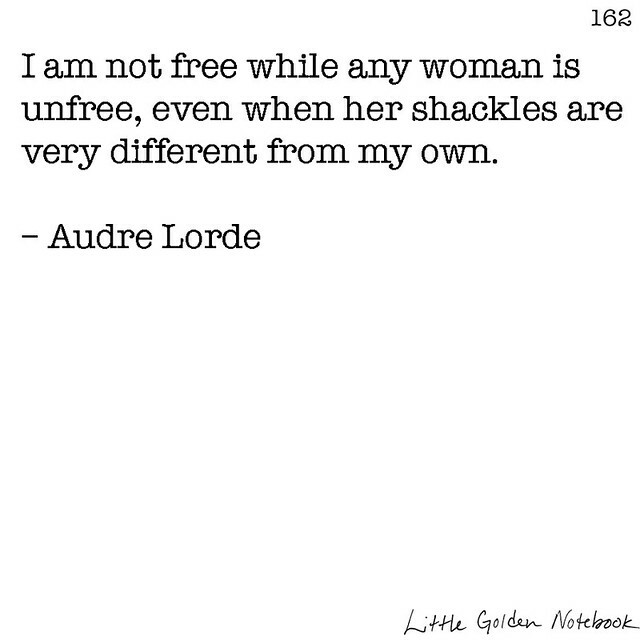 One day, she told the shady therapist this, so when he put her under, he would ask her to imagine having the dreams she was missing. She was surprised to listen to herself talk about those old dreams, most of them flying dreams. On the bus home to Squirrel Hill, she passed the Cloud Factory and imagined what it would be like to glide into Skunk Hollow and through the factory’s clouds, what it would be like to be free and happy, heart and body soaring. The Cloud Factory sits in Panther Hollow on the edge of Oakland. It’s looks like a factory, of course; it’s gray and has silos and towers and one giant brick chimney that the clouds come floating up out of into the sky above. In the winter when the warmth and moisture from the cloud works inside the factory hits the frigid dry air, you can see the clouds dispersing quickly, shrinking, but still managing to puff upwards to join their sisters and brothers traversing the land. In the summer, the clouds seem to grow as they emerge from that big chimney. Watching thunderheads form above the factory in a sunset is awe inspiring. What most people don’t know is that the Cloud Factory also makes dreams. As air and moisture are pumped through the machinery of the cloud works, they are infused with dream seeds at different intervals. The dream seeds can and do grow into any kind of dream, of course, it all depends on the dreamer. The seeds are planted as clouds disperse in the wind or are evaporated by the sun or when it rains or snows or sleets. They are so small, dreamers don’t notice them coming into their hearts and minds to be watered with emotion and reaction to bloom in the night during sleep.